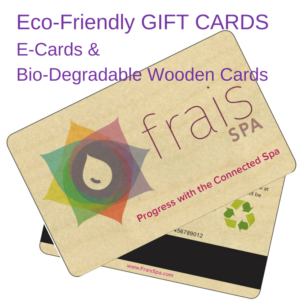 Discover Frais Spa and its Green initiative in honoring its sustainable spa practices: from paperless receipts to wooden gift cards! Happy Earth Day! 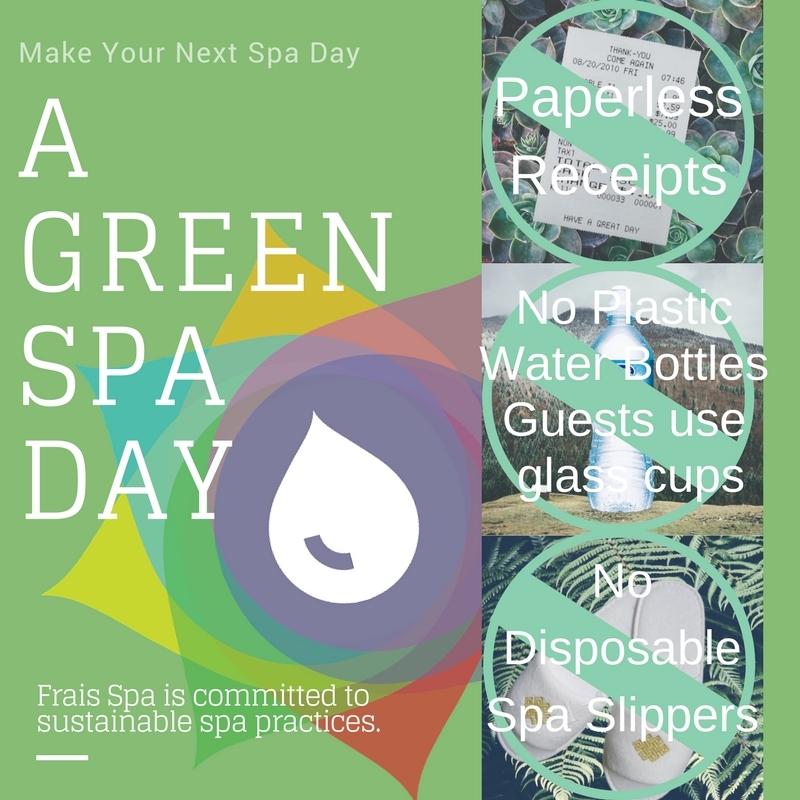 Frais Spa is a Green Spa! Earth Day is Saturday April 22nd. Paperless Receipts: Our patients and clients have really expressed how convenient having digital receipts sent to them. We have found there is no need to have hard-copy receipts anymore with our touch-screen signature receipt capture system. From the beginning, we instill high hydration to our guests before and after their massage sessions. We use glass cups to offer our infused water beverages and glass champagne flutes every day. No need to put thousands more plastic or paper cups into land-fills. For the comfort of our spa guests receiving premium spa services, we offer the use of our spa slippers. These slippers are are re-usuabe, cleaned, and sanitized for every guest. Our guests appreciate they are not contributing to the environmental impact of producing foam disposeable spa slippers. NO PLASTIC GIFT CARDS! A great way to celebrate Earth Day is to give someone a wooden gift card! All our gift cards are produced from wood from sustainable forests. They are re-useable and re-chargeable for the convenience of our clients. If a client decides not to re-use their card, the card is bio-degradable, unlike the millions of plastic gift cards that are made from petroleum products and take hundreds of years to degrade. We are active promotors of the Green World Campaign. When you check out of our online booking system, you will be have an option to also contribute to this great cause. Watch for their talks, tree plantings, and events as Earth Day approaches. 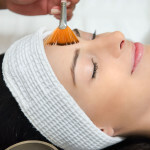 We use EmerginC Organic products for all our Premium and Express facials. You will find how organic skin products can be as effective and definitely safer than those products on the market that are synthesized from chemicals. We love how EmerginC plants thousands of trees on our behalf each time we use their products. Frais Spa is always continuing to find innovative ways to have sustainable business practices. If you have any suggestions on how we can better serve you in a ‘green’ way, please do not hesitate to place a comment below. It is truly relaxing to know that your spa day is as ‘green’ as can be every time you visit Frais Spa. Would you like to know more about Frais Spa? We would love you to follow us on Facebook or Instagram.